Here’s another in my periodic series of forgotten cavalrymen. I wish I had thought to name this series “Fiddler’s Green”, as Don Caughey calls this sort of profile on his blog. Ah, well. Robert Horatio George Minty was born in Westport, County Mayo, Ireland, on December 4, 1831. His father was born in Ireland and his mother was born in Scotland. His father was in the British Army. In 1848, Minty entered the British Army as an Ensign and served five years in the West Indies, Honduras and the west coast of Africa. On November 11, 1857, he married Grace Ann Abbott of London, Ontario, Canada at St Paul’s Cathedral in Port Sarnica, Ontario, Canada, where his first child, Nan R. G. Minty, was born on September 29, 1858. After Nan’s birth, the family moved to Michigan. 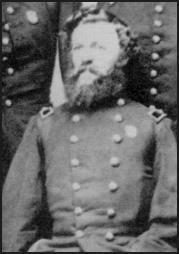 Minty was commissioned a Major in the Second Michigan Cavalry in 1861, Lieutenant Colonel of the Third Michigan Cavalry a few days afterward, and was made Colonel of the Fourth Michigan Cavalry in July, 1862. He commanded the brigade of which the Fourth Michigan formed a part a greater portion of the time during its service in the field. Minty, an Irish-born soldier of fortune, was one of a kind, having learned to use the saber when fighting for the queen in Africa. Consequently, his brigade became known as the “Saber Brigade,” perhaps as a result of two successful mounted charges, both led by Minty, against Joseph Wheeler’s dismounted cavalry, which was trying to hold entrenchments at Shelbyville in June 1863. Minty received a brevet to brigadier general of volunteers in March 1863 in recognition of his brilliant service throughout the war. Minty conducted one of the most effective covering force actions of the Civil War at first Pea Vine Ridge and then fell back to Reed’s Bridge, across Chickamauga Creek. Minty made a determined stand on Pea Vine that morning, including a section of the Chicago Board of Trade battery, and then covered his retreat across Reed’s Bridge with mounted charges from a battalion of the 7th Pennsylvania Cavalry, which was known as the Saber Regiment. Minty’s stand is especially impressive because his brigade fought all day, with 900 men, opposing the four infantry brigades of Bushrod Johnson, numbering roughly 5000 Confederates. His men pulled up the planks to Reed’s Bridge, but the 23rd Tennessee re-planked the bridge (under fire) with siding from Reed’s Barn. This was a textbook delaying action every bit as effective and every bit as important as that fought by John Buford at Gettysburg on July 1, 1863. Unlike Buford, who could disengage after a couple of hours and let the I Corps take over, Minty’s troopers were engaged from perhaps 10:30 am until at least 4 pm. However, and also unlike Buford’s stand, it got little attention and even less praise, perhaps because Chickamauga was a debacle for the Union while Gettysburg was a signal Union victory. The tactics were identical, and the results nearly so. After the war he settled in Jackson, Michigan and raised a total of 10 children. Minty was General Superintendent of the Grand River Valley Railroad. In Alameda County, California, on February 6, 1870, he divorced Grace Ann Abbott and subsequently married Laura Abbott in Maysville, Mason County, Kentucky on May 14, 1871. Robert H. G. Minty died in Yavapai County, Arizona on August 24, 1906 and was buried with full military honors in Ogden, Utah on September 3, 1906. He was one of the very best Union cavalry brigade commanders but has been largely overlooked because of his service in the Western Theater. Had he fought in the Eastern Theater and accomplished the things he accomplished in the West, he would be in the pantheon of great cavalrymen of the Civil War. He deserves to be included in those exalted ranks. My first book was published in 1998. It’s titled Gettysburg’s Forgotten Cavalry Actions, and was published by Thomas Publications of Gettysburg. The book covers Farnsworth’s Charge, Merritt’s fight on South Cavalry Field, and the Battle of Fairfield, all actions that took place on day three of the Battle of Gettysburg. Old friend Rick Sauers talked me into doing it as a book. I had written an article on Merritt’s fight that was published in Gettysburg Magazine and one on Fairfield that was published in America’s Civil War, and my original intent was to complete the trilogy with an article on Farnsworth’s Charge. Rick talked me into compiling it all together and publishing it as a book. It’s short–only about 150 pages, including index, etc.–and just a little bit disjointed because of how it came together. There’s one chapter of nothing but verbatim quotes pertaining to Elon Farnsworth’s death that’s quite interesting, but breaks up the flow of the book a bit. It probably should have been an appendix and not a primary chapter. It features John Heiser’s fine maps and a good assortment of photos. It’s definitely not my best work; my writing has improved dramatically over the years (practice makes perfect). However, it was very well received, and it won me the Bachelder-Coddington Literary Award as 1998’s best new work interpreting the Battle of Gettysburg. 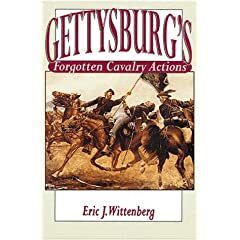 In retrospect, I should have included the Battle of Hunterstown when I wrote this book, as it is also one of Gettysburg’s forgotten cavalry actions. Fortunately, J. D. and I have made that particular omission right in Plenty of Blame to Go Around: Jeb Stuart’s Controversial Ride to Gettysburg. Thus, I would probably leave it out of any re-write of the original book, even though including it would definitely be in keeping with the theme of the work. Over the years, it’s been a steady but unspectacular seller. It has sold about 4000 copies over these eight years, and it’s just about out of print. There are less than 200 copies left in inventory at Thomas, and I hear that Thomas is having significant financial problems. My last royalty payment is significantly late, and so are the payments of some other Thomas authors. Frankly, I’ve always been a bit disappointed in the marketing effort of Thomas. Thomas is not affiliated with a major distributor, so the availability of Thomas titles is limited, and you won’t find them in the big chain bookstores unless someone places a special order. This means that circulation is much more limited than it would be with a publisher who works through a distributor. Several months ago, I sent a letter to Dean Thomas asking whether he intends to reprint the book, and he says no, he doesn’t intend to do so. That means it’s going to go out of print very shortly, although Dean is willing to revert my publication rights to me now. This creates a dilemma for me. Do I seek a new publisher for it as originally written? Or do I do a complete rewrite of it that adds some of the new material that has surfaced in the years since the book was published, add a walking/driving tour, and tighten up the prose? Or do I bag the whole thing altogether, let it go out of print, and save the rework for the three-volume history of the cavalry in the Gettysburg Campaign that J. D. and I are planning? I’ve had one conversation with Ted Savas about doing a new edition, and Ted expressed some interest in a pretty complete re-work of it. Ted understandably has concerns about demand for an eight year old book, even if it is completely overhauled from top to bottom. I am going to put together some ideas for him about what I would change in it this week, and we will see what he says. In the meantime, I thought I would poll you–my regular readers–and see what you think about the idea. What say you? Which of the three options should I pursue? Tom Perry is pleased to announce publication of Stuartâ€™s Birthplace: The History of the Laurel Hill Farm. 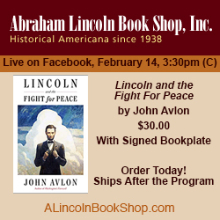 The book is available beginning on February 6, 2007, J. E. B. Stuartâ€™s 174th Birthday. Perry Comments: â€œIn 1986 Professor Emory Thomas published his biography of J. E. B. Stuart Bold Dragoon, the first biography in nearly thirty years since Burke Davisâ€™s The Last Cavalier. After reading this book I remembered how prominent Stuartâ€™s place in our nationâ€™s history really was and all the famous people and events he touched in his short thirty-one years. I spent the next few years reading about him and then about 1988 I decided that something should be done to save part of the Laurel Hill property and with that I began researching Stuart and his family for the next twenty years. This new book, my third relating to Stuart and/or the Civil War is full of new information. For the first time the life along with the personal and financial problems of Archibald Stuart, General Stuartâ€™s father, are examined in detail. This book is based on first hand accounts from manuscript collections all over the country especially the university libraries in Virginia and North Carolina. A chapter on Stuartâ€™s wife Flora, who survived him by fifty-nine years, and her descendants down to 2006 is presented for the first time. The three chapters on â€œJebâ€ Stuart are full of lots of new information. Specifically, I focused on his deep religious faith and sobriety, which is far from the image of the romantic cavalier he cultivated. Stuart joined the temperance movement founded churches and even bought his soldiers copies of the scriptures. For the first time Stuartâ€™s seven year career in the United States Army is covered relying on information gleaned from the National Archives. Areas overlooked in his career during the War Between The States such as his role at the Battle of Chancellorsville, where he replaced the wounded â€œStonewallâ€ Jackson leading an entire corps of infantry. His role in the largest cavalry battle in the Western Hemisphere at Brandy Station in June 1863 and the way he gave Robert E. Leeâ€™s Army of Northern Virginia time to escape after the Battle of Gettysburg and the postwar controversy about his role in that battle are covered. Finally, Stuart’s last days on earth culminating with his mortal wounding and death on May 12, 1864, after the Battle of Yellow Tavern, just north of Richmond is covered. There is an entire chapter about the preservation of the site beginning in the 1960s up through 2006. The many people who assisted in saving part of the Stuartâ€™s Birthplace are covered especially those in before the forming of the J. E. B. Stuart Birthplace Preservation Trust, Inc. and the early days of the organization we started in 1990. This book tells the story of the farm in Ararat, Virginia, that was the birthplace and boyhood home of Patrick Countyâ€™s most famous son James Ewell Brown â€œJebâ€ Stuart and the many other people who lived there. In 255 pages the story of Stuartâ€™s family from their arrival in North America in 1733 through 2006 is told with a seven page bibliography and index. Laurel Hillâ€™s history begins with prehistoric times including information on the Native-Americans, the American Revolution, Antebellum Farm Life and the life of J. E. B. Stuart, who served in the U. S. Army and fought against it in the Confederate Army of Northern Virginia as commander of Robert E. Leeâ€™s cavalry in the Civil War. The life of the African-American Slaves beginning in 1780 through 1859 (nearly 50 souls) is covered in detail gathering information from original sources in the Patrick and Henry County courthouses. The book reveals the lives of the women of Laurel Hill such as Elizabeth Perkins Letcher Hairston, who saw her husband, William Letcher, killed by Pro-British Tories in the American Revolution and then married George Hairston of Henry County. The book tells of Elizabeth and William Letcherâ€™s daughter, Bethenia, who married into the Pannill Family and was grandmother to J. E. B. Stuart. The book tells of the life of Stuartâ€™s mother Elizabeth Letcher Pannill Stuart and J. E. B. Stuartâ€™s widow Flora Cooke Stuart along with information about the Stuart children and their father, Patrick County Attorney and politician Archibald Stuart. Laurel Hill Farm after the Stuartâ€™s sold it in 1859 is covered pointing out the history of the Patrick Countyâ€™s most historic community of Ararat with stories of Revered Robert Childress â€œThe Man Who Moved A Mountainâ€ and the midwife made famous by the cabin along the Blue Ridge Parkway, Orleana Puckett. The book concludes with a chapter on Perryâ€™s personal work to preserve the site along with the preservation interest of the Brown, Dellenback and Mitchell families of Ararat, Virginia. The book may be ordered at http://www.freestateofpatrick.com/book.htm or by check payable to Tom Perry P. O. Box 50 Ararat, VA 24053. The cost is $25 plus $5 tax and shipping. May 1, Stuart’s Birthplace, 5 p.m until…, Ararat, Virginia. May 10, Reynolds Homestead, 11 a.m. Book Discussion, Critz, Virginia. Historian Thomas D. Perry is the Founder of the J. E. B. Stuart Birthplace and hold a BA in History from Virginia Tech (83) He is the author of Ascent To Glory: The Genealogy of J. E. B. Stuart ($20) and The Free State of Patrick: Patrick County Virginia in the Civil War ($30). Stuartâ€™s Birthplace: The History of the Laurel Hill Farm ($30) are available on Perryâ€™s website or by sending check payable to Tom Perry P O Box 50 Ararat VA 24053. 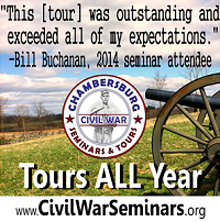 Perry speaks all over the country on topics related to J. E. B. Stuart, the Civil War and Patrick County history. You can see the latest events by visiting the following webpage http://www.freestateofpatrick.com/coe.htm. Perry will speak to any church, civic or school group in Patrick County free of charge. He was the recipient of the George Waller Sons of the American Revolution Citizen of the Year in 2004 for Patrick and Henry Counties and the North Carolina Society of Historians Award for a magazine article on J. E. B. Stuartâ€™s North Carolina Connections in 2005. In 2006, the J. E. B. Stuart Birthplace honored the Perry Family for its work in preserving Stuartâ€™s Birthplace. Tom produces a monthly email newsletter about Patrick County History from The Free State Of Patrick Internet History Group, which has nearly 400 members. Here’s a link to the story on yesterday’s event that ran in the Carroll County Times newspaper today. Tomorrow is my 46th birthday. I can recall times that don’t seem all that long ago when the very concept of turning 46 was inconceivable; that was old age, for heaven’s sake. Evidently–hopefully–that’s not the case. Some days, I feel old as the hills but only slightly younger than dirt, but other days, I feel 18 again. It all depends. What’s particularly interesting is that tomorrow is also my good friend and co-author, J. D. Petruzzi’s birthday. J. D. is four years younger than I am, but I find it really remarkable that we share the same birthday. I left yesterday afternoon at 1:30 and arrived in Gettysburg at 7:15. I met J.D. for dinner, and then we went and had a couple of beers at the Reliance Mine Saloon. I had a very interesting conversation with Bill Frassanito about lots of things, and we were all out of there by 11:00. We were up at 6:00 AM today, got ready, loaded up the car and headed off to The Avenue restaurant for breakfast. We headed out for Westminster (which is almost an hour drive) for the conference. Our navigator was too busy obsessing over bicycles and didn’t tell me to turn in time and we went about 7 miles out of our way. We finally got to the site of the conference, and J. D. and I led off. We spent about half an hour being interviewed by a reporter who knew absolutely NOTHING about the Gettysburg Campaign, and then signed books for a couple of hours. We did have a chance to visit with old friend Dean Shultz and then headed back up to Gettysburg. The weather was atrocious, and not conducive at all to battlefield stomping, so we limited ourselves to a lap around the battlefield, mainly to check out the latest round of tree cuttings. Seeing a large portion of Culp’s Hill cleared of trees is really remarkable, and really changes the appearance of the battlefield in a major way. I dropped JD and our host off and headed out for another lovely six hour drive, and got home at 8:30 or so. I’m exhausted. It was a major banzai run. I was gone for 32 hours, and spent 12 of those 32 hours driving. I’m just glad it’s over. 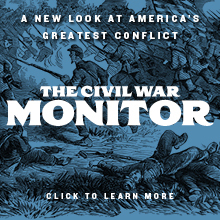 Chris Lewis, the editor of Civil War Times Illustrated, liked my idea of an article on the connections between Ulric Dahlgren and David Herold, so I’m going to explore expanding it into a 4,000 word feature article. We’ll see how it goes, and we’ll see if there’s enough to make it worthwhile, but I’m going to give it a shot. I’ve got two other articles in various stages that need to be completed first, but then I’m going to focus hard on pulling the thing together. For now, the working title is “A Tale of Two Assassins”. I will keep everyone posted as to progress. Today marks one month since I had the cortisone shot, and I’ve had major improvement. It’s 85% better. I continue to wear a band to keep pressure on the tendons, but it feels a great deal better. I’m able to do most of my normal activities either pain free or with very minimal pain, so it’s back to normal and back to my normal blogging schedule. Thank you very much to everyone who wrote to express their concern and best wishes for improvement. It means a lot to me, and it also helped a lot. If history holds true, it will flare back up again in a few months, as that’s been the pattern for 25 years. For now, though, it’s feeling pretty good. Posting frequency will probably increase (providing I have something worth saying, that is) now that I don’t have to watch every keystroke. Thanks for your patience and support. This Saturday, March 24, J. D. Petruzzi and I are the keynote speakers at the annual Maryland in the Civil War: A Regional Perspective put on by the Historical Society of Carroll County, Maryland. The event is held in Westminster, which is the county seat of Carroll County. J. D. and I are the opening speakers that day, and we will be discussing one of the most important but least known episodes from our Stuart’s Ride book, the charge of the 1st Delaware Cavalry, also known as Corbit’s Charge. We’re on first, from 9:30 to 10:30. The conference is being held at Carroll Community College, 1601 Washington Road, in Westminster. Lunch is included. We will be signing books after our talk, and we will be around all morning that day. Hopefully, if anyone’s in the area and is available to drop by, I hope you will do so, and if you’re not someone I already know in person, please be sure to introduce yourself. We will also be around Gettysburg Friday night before the conference, probably enjoying an adult beverage or two at the Reliance Mine Saloon. If anyone wants to come by and have an adult beverage or two with us, please feel free to do so. I’ve continued to explore the connection between Ulric Dahlgren and Davey Herold, which I first mentioned in this blog on February 27. My research indicates that it’s quite probable that Herold and Dahlgren knew each other, but it’s now clear that they didn’t attend Rittenhouse Academy at the same time; they missed each other by a couple of months. Herold’s father was the clerk for the Washington Navy Yard, and the family lived in a large brick house right outside the gates of the Navy Yard on 8th Street. Davey Herold attended a private school as a boy and then attended Georgetown College from 1855 to 1858, where he studied pharmacy. He entered Rittenhouse Academy in January 1859. He then took a job in the pharmacy at the Navy Yard. Ully Dalgren left Rittenhouse Academy in December 1858, meaning that they just misssed each other at school. However, I think it’s not only probable that the two young men knew each other, I think it’s quite likely. They were two months apart in age. They grew up in precisely the same environment, the Navy Yard. Given that Ulric’s father commanded the Navy Yard while Davey Herold worked there, there’s no question that the families knew each other. When Ully came home to his father’s house to recuperate after his July 1863 leg wound, Davey Herold may well have delivered medicine to Ully, and the two may have reminisced about their common childhoods. Both died very young as a consequence of their participation in plots to assassinate a head of state, and I can’t help but wonder whether learning of Dahlgren’s participation in the plot to kidnap and assassinate Davis in any way influenced Davey Herold’s decision to join John Wilkes Booth’s assassination conspiracy. This connection, which has never been explored by anyone (thanks again for bringing it to my attention, Pete Vermilyea), and it’s REALLY intriguing. I’ve proposed an article on it to Chris Lewis, the editor of Civil War Times Illustrated and hope he will take me up on it. It will be fascinating indeed to see how it plays out. I will keep everyone posted as to the progress of this particular project.